Highrise condo building adopts a waste reduction method the city intends to study in order to keep the 50 per cent of household waste that is organic from ending up landfills. Paul Rubbra used to cringe at the sight of bags containing food scraps, coffee grinds and paper towels that had come sliding down the garbage chute of this 22-storey condominium in Etobicoke. Not anymore. That’s because this highrise, at 812 Burnhamthorpe Rd., converted its chute to one that’s only for organics, a move to keep those items out of landfills. It is one waste reduction method the city intends to study early next year. Two other condos in this complex, known as Millgate Manor, are also thinking of converting to organics chutes. Before the switch in May, Rubbra says only about 30 per cent of residents put their organic waste in the appropriate green bin. Most people didn’t want the hassle of carrying it, sometimes in a dripping plastic bag, through the hallways, downstairs and outside to an overflowing smelly bin that attracted wasps, skunks and raccoons. So they tossed it down the garbage chute. 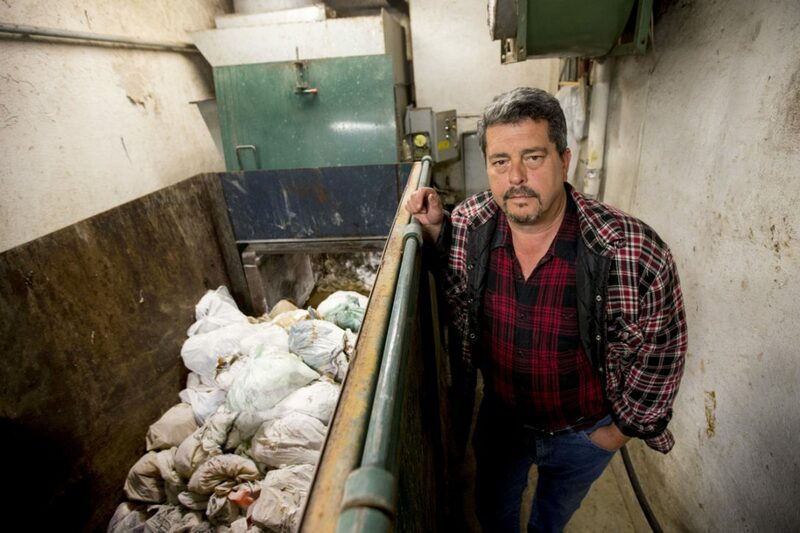 Since the change, he says, nearly everyone is properly disposing of their organic waste. That means they carry down their garbage and recycling to bins located outside. 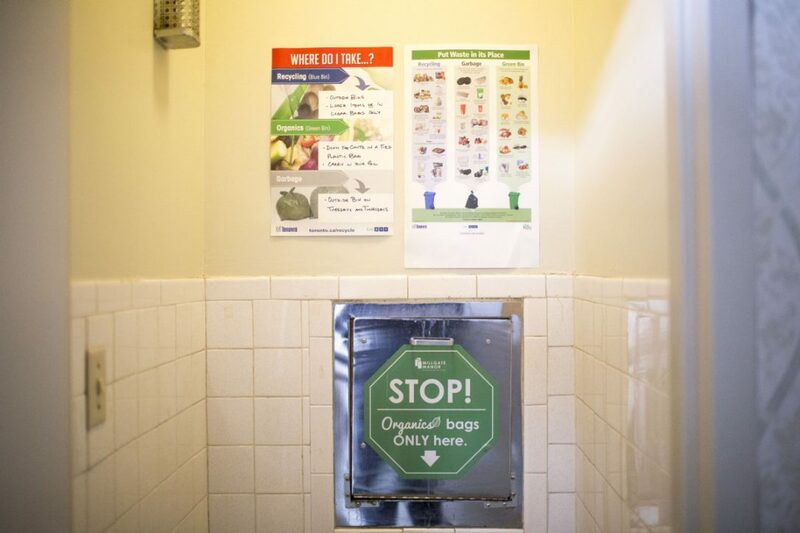 Rubbra says they don’t mind because the organics chute allows them to conveniently get rid of smelly waste items, such as cat litter, diapers and fruit and vegetable scraps. The city wants to improve waste diversion rates, particularly in multi-residential buildings. Nearly half of Toronto residents live in apartments, condos and co-ops, but they recycle and compost only 27 per cent of their waste, compared with 65 per cent in single-family homes. One of the challenges is that older multi-residential structures typically have one trash chute that runs down the building, which residents access on every floor. So it’s easier to toss everything down that one chute. By contrast, all new buildings in the city are required to have a tri-sorter chute, three separate chutes or the ability to easily collect all three streams. But even if buildings have the capability to separate all three waste streams that doesn’t mean they’re doing it. Currently, only buildings with city collection have to separate recycling, garbage and organics, but those with private collection have no obligation. That’s why Toronto is considering a bylaw that would force all residential buildings to collect organics, regardless of who provides waste collection services. Meanwhile, the province of Ontario is considering banning organics from landfills. McKay and his staff want to know what waste diversion and reduction practices make a difference — and what factors are necessary. They’re currently reviewing information gleaned from the 2016 Mayor’s Towering Challenge, which was a six-month contest open to residential buildings to increase recycling and reduce more. They want to know if a particular practice, or program, can be successfully replicated elsewhere. To find out, the city will run a series of experiments, beginning in 2018, testing practices in various buildings, with different demographics. For instance, it may test the success of collection programs for batteries, compact fluorescent light bulbs and paint cans; and sharing programs for things such as tools, electronic gear and camping equipment. One practice it will study more closely is converting a garbage chute into organics-only. The city is now identifying which buildings have done this and which ones are willing to do it. At the Etobicoke highrise the recipe for success includes all those ingredients. Last year, Rubbra came up with the idea to convert the chute to collect organics. There was already a strong practice amongst condo owners of recycling so diverting even more waste seemed the next logical step. Property management and the board of directors were keen to learn more. They spoke with Emily Alfred of the Toronto Environmental Alliance — an environmental advocacy group — who told them about a Scarborough condo building called Mayfair On the Green that had successfully cut its waste through converting its chute to organics only. “Organics make up about 50 per cent of household waste, so it’s a really important part of the waste stream to tackle,” says Alfred, a senior campaigner. And, she says, less garbage means lower waste fees. In Toronto, you only pay for garbage pickup, whereas recycling and organics is free. After a tour of the Mayfair building, a dedicated team of residents from the Etobicoke building spent four months preparing folks for what was coming. Messages were posted on electronic bulletin boards in the lobby and elevators, information meetings were held, and notices were handed out door-to-door. And the city supported the change, providing posters and pamphlets on waste diversion in various languages that were displayed in the lobby. On each floor the chute opening was reduced — a six-inch chain was attached — so that it was just big enough to fit a small grocery bag of organics, but not a big garbage bag. The conversion was an immediate success, recalls Rubbra, noting there’s far less garbage being produced.